The Itty Bitty Kitty Committee: Matches, Matches, Matches! Yesterday had us nervous! We had a big fat match to meet, and the morning started off oh so slow! Thankfully, in the late afternoon things really picked up, we had a little fundraising frenzy, and ended up meeting the match an hour and a half before our deadline. And even after the match was met, another squillion trickled in last night! What a day! We've got THREE matches happening today. Don't worry, they're totally doable -we've got two $500 matches, and one $750 match. We'll spread them throughout the day, so the pace should be easy to keep up with. Our first $500 match is from our friend Mary, who gave us the $500 match on the 4th of July (her birthday). Mary's touched by those "I wish I could give more" comments we see on our FUNdraising page, so she wanted to offer up the match so the dollars from those commenters can become more. How generous of you, Mary! Thank you! Because we've got three challenges today, they'll be quick ones. Mary's will run until 10:30 (Pacific Time). After her match is met, we'll move on to the next. To get your dollars doubled this morning, please give us a holler! We'll be waiting for your call! We've got lots happening again today. We've got a little Wylla video to share , a visit or two from our little temp workers again, and of course, three matches ! Also, the Wylla watercolor painting auction is ending this morning at 10:45 AM, If you wanted to get a bid in, you can visit the auction HERE. OH, friends we are getting so close. Did you look at our total this morning? Currently, we are a wee $7, 375 away from hitting our huge $100,000 goal. I'm confident will hit it now and even go squillions past it too. What do you think? What do you predict our total will be this year? A watched phone scares you when it rings! Nice to see an extra set of paws to help with the final days! Right? 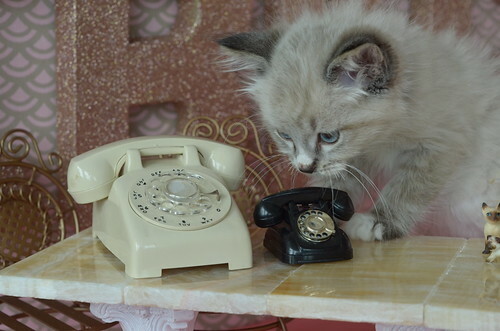 That cat will jump out of its skin if that phone rings. I definitely would! I anticipate being wrong on these.